Ron Proctor (#27) ran to the triple crown victory on opening night at Devil’s Bowl Speedway on Saturday. WEST HAVEN – The youth movement was put on hold at Devil’s Bowl Speedway on Saturday night, May 9, as the two oldest drivers at the speedway ran away at the front of the pack. Two-time Modified division champion Ron Proctor and long-time racer Leon Gonyo – each of whom turns 62 years old soon – finished 1-2 in the 100-lap main event kicking off the NASCAR Whelen All-American Series campaign. The race was the second of seven events in the two-track spring championship series. Charlton, N.Y., veteran Proctor put on a clinic to win his qualifying heat, the bonus-points semi-feature, and the 100-lapper for a rare “triple crown” win. Proctor had both a fast car and good fortune. He was running a close second to leader Bucko Branham at lap 46 when three lapped cars tangled in their path. Branham spun his car to avoid the crash, but a small electrical fire inside his car during the caution period put him out of the race; he was uninjured. As racing resumed, new leader Proctor’s biggest worry was lapped traffic. Gonyo, of Chazy, N.Y., came from deep in the starting order to second place and closed to within five car lengths of Proctor, but was never able to mount a serious challenge and settled for the runner-up spot. Nick Heywood of Plattsburgh, N.Y., saw his tough day end well; the winner of the Airborne opener blew an engine during afternoon practice and missed his qualifying heat. After starting 14th in the main event in a backup car, he finished a strong third. Vermonters Joey Roberts and Vince Quenneville, Jr. rounded out the top five, followed by Greg Atkins, Cody Sargen, rookie Timex Morgan, Jason Durgan, and Jamie LaFountain. Heywood holds a four-point lead, 109-105, on Atkins, heading to the third Spring Championship Series event at Airborne Park Speedway in Plattsburgh, N.Y., on Saturday, May 16. Quenneville is another two points back at 103, followed by Durgan and Morgan. Eighteen year-old Brandon Atkins of Au Sable Forks, N.Y., won the 50-lap race for the Late Model division. Atkins held control for most of the race, but was forced to contend with Josh Masterson of Bristol, Vt., after a late restart. Atkins used the outside lane to his advantage and went on the win. Masterson was second ahead of Todd Stone, Robert Bryant, Jr., and 2014 champion Jamie Fisher. Richie Turner of Fairfax, Vt., made it two-for-two to open his season by winning the 25-lap feature for the Renegade division; Turner also won the Airborne opener on May 2. Keith O’Neil of Mooers, N.Y., made his first visit to Devil’s Bowl Speedway count by winning his qualifying heat and taking second place in the feature. 16-year-old Dylan Rabtoy of Swanton, Vt., nipped Jason McClatchie for third place by less than a foot in a thrilling, fender-banging duel. Track champion Robert Gordon finished fifth. Dale O’Neil of Mooers, N.Y., one-upped his father Keith by winning the 15-lap feature for the Mini Stocks, marking his first victory at Devil’s Bowl. Defending champion Chuck Bradford of Addison, Vt., finished second ahead of C.J. LaVair, John McCarron, and Jake Noble. 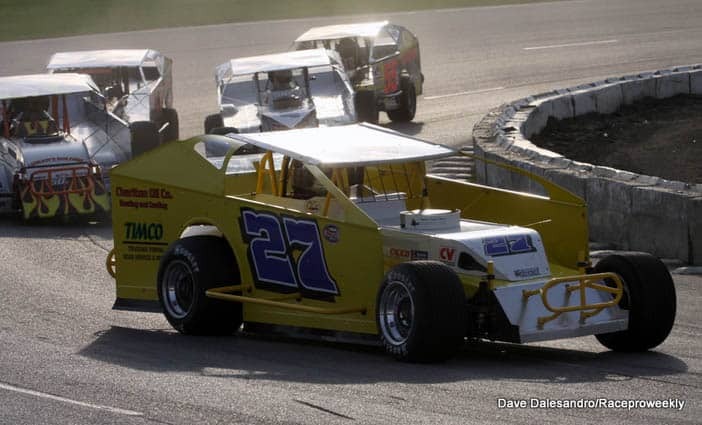 Action resumes at Devil’s Bowl Speedway on Saturday, May 23 with a 100-lap Renegade race, along with a wild-and-crazy Enduro for strictly stock cars. Modifieds, Late Models, and Mini Stocks are also on the card, as well as guided pit area tours for the Kids Club. General admission is $12 for adults, $10 for seniors, and free for kids age 12 and under; racing begins at 6 p.m.
For more information, visit www.DevilsBowlSpeedwayVT.com or call (802) 265-3112.